Quality control is an important part of a production system. It helps to guarantee a reliable and efficient production. Its purpose is not only focused on quality inspection and documentation but also on giving feedback to production control (Fig. 1) (Imkamp et al. 2012; Schmitt and Damm 2008). A quality control system is set up by means of quality control cycles. As depicted in Fig. 1, quality control consists of two main features: measurement technology and quality management measures. The measurement technology is used to determine the current production quality. For the application of measurement technology, two elements are required: sensors and software-based data analysis tools. These return the measured production quality. While included data analysis tools are often supplied with commercial measurement technology hardware, they have to be specifically developed for new measurement technology designs. By comparing the desired quality with the measured quality, a potential gap of quality is detected. The detected lack of quality is used as input for the subsequent quality management evaluation to derive instructions for improving the production processes in production system. Thus, the quality management process closes the control cycle to ensure consistent production quality in the production system. The quality management process works best if it is able to support the production processes by providing a continuous supply of instructions and feedback. This can only be achieved if the quality management process receives a continuous flow of information on the gap of quality, as well. The requirement can be fulfilled best by integrating measurement technology in the production system, which produces an ongoing stream of quality measurement data. This type of measurement technology is called “in-line measurement technology.” In-line measurement technology is usually more resilient to environmental challenges and has shorter measuring times than laboratory-based measurement equipment. On the other hand, in-line technology is often less accurate and needs complex software to handle the continuous flow of measurement information. Although repeated in-line measurements cause additional costs in comparison to end-of-line inspections, they help to achieve long-term savings. Costs caused by production errors increase with every value-adding step that follows after an error occurs. The value is added to a part that is going to be sorted out during the end-of-line inspection. Therefore, the costs of repeated in-line inspections are often lower than the accumulated costs of the following production steps. Figure 2 shows this effect. In-line measurements allow to spot production errors early on and prohibit any further work on faulty workpieces. Monitoring the production with in-line measurements is therefore especially important for incapable and instable production processes as they have a high probability of an early production step causing an error. Using in-line inspection during the production ensures that errors are spotted as soon as they occur and rework may be done shortly afterward. Summarizing, in-line quality control helps to save costs by detecting production errors early in the production process (Schmitt and Damm 2008). Achieving a high standard of quality is another reason for using in-line measurement technology. This is especially true if the product quality is directly linked to the company’s brand image as it is the case with, e.g., machine tools producers. Reliability is one of the most important features of a company’s image. If products of low quality are delivered to the customer, the company would quickly lose valuable market shares. To ensure produced goods have 0% defects, 100% need to be inspected. In-line quality control is able to provide such a 100% inspection. Companies are only able to deliver the quality their customers expect by using in-line quality control. This type of in-line inspection is used with automotive suppliers. Modern emission rules require a very high operation pressure for injectors. This leads to tight tolerances, which can only be guaranteed by in-line inspections. These enable faulty parts to be detected and to be phased out (Imkamp et al. 2012). This chapter is structured into three parts. In section “In-line Measurement Technology,” different types of in-line measurement technology are defined and structured. Afterward, section “Designing an In-line Quality Control System” presents a method for designing adequate quality systems based on in-line measurement technology and suitable quality control cycles. The chapter closes with practical examples providing insight on how to apply the presented method to achieve effective in-line quality control in industrial production systems. This section aims at clarifying the term “in-line measurement technology.” In-line measurement technology is part of the production system itself and, therefore, is able to provide a continuous stream of information on the quality of the production system. In general, measurement technologies can be differentiated by how they are integrated into the production system. Based on this, different subcategories of integration levels can be separated (Fig. 3). Often, the subcategory on the right side is used synonymously for the name of the whole integration level (Schmitt and Damm 2008; Damm 2013). Figure 3 differentiates between the subcategories to stress that both subcategories are part of the same integration level. The first level of Fig. 3 distinguishes between “on-shopfloor” and “off-shopfloor.” “On-shopfloor” defines a measurement on the production shopfloor, whereas “off-shopfloor” means a measurement in a laboratory. The second level distinguishes between “in-line” and “off-line.” The term “in-line” describes measurement technology, which is included into the production line. In-line as well as off-line technology is located on the shopfloor. Typical examples for in-line measurement technology are automated optical quality inspection systems in the automotive industry. For these, cameras are mounted on robots which allow for an automated inspection of every part in the line. An example for off-line (sometimes referred to as “at-line”) measurement technologies is special coordinate measurement machines (CMMs). Most CMMs are placed in a laboratory and allow for highly precise measurements. Some measurement technology manufacturers offer special versions of these machines designed for the harsh environment on the shopfloor. They are more resilient to temperature changes and are not easily affected by dirt or moisture. These off-line machines can be used to take samples as part of statistical process control (SPC). Following Fig. 3, in-line measurement technologies can be separated into two subcategories, “on-machine” and “off-machine.” While on-machine measurement technology is included in production equipment, off-machine measurement technology is included in a separate measurement station integrated in the production line, such as the automated optical inspection described above (Schmitt and Damm 2008). These separate measurement stations are used whenever many measurement features need to be detected and measurement information is not needed for direct control of the production process. On-machine measurement technology, on the other hand, is used to directly control a production process by instantly providing feedback within the equipment (Schmitt et al. 2011; Damm 2013). An example for an on-machine inspection is the measurement of a workpiece while it is still mounted in a machine tool. For these measurements, highly precise optical sensors can be used. On-machine technology is classified into two subcategories, which are “off-process” and “in-process.” While in-process measurement technologies record data during the execution of the production process, off-process measurement technology starts recording data while the workpiece is still in the machine, but before or after the production process has finished. Both techniques have different advantages: In-process measurements can be used for direct control of the current production process while it takes place. However, in situ measurements allow for more complex measurement technologies to be used, for example, when a workpiece is still mounted in the machine tool. 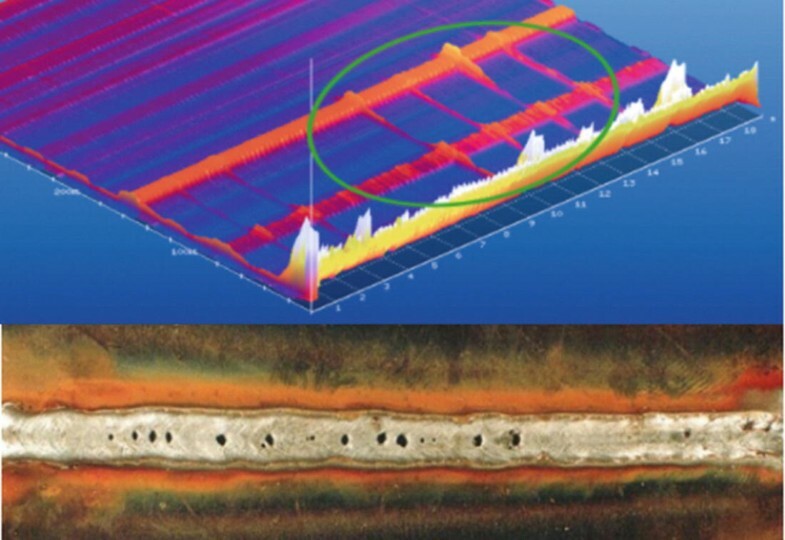 As an example for in-process measurements, acoustic measurements are used to evaluate the quality of welding seams during the welding process. If a lack of quality is detected, the welding parameters such as the welding current can be adjusted accordingly. The results from both types of measurement technology can be used to give immediate feedback to decide if rework is needed while a workpiece is still mounted in the machine (Schmitt and Damm 2008). All measurement technologies featured in the category “in-line measurement technology” are able to provide continuous information on the production quality. Therefore, they are most suitable to be used in in-line quality control cycles which enable very high levels of quality (Schmitt and Damm 2008; Damm 2013). The first step of designing an in-line quality control system is the task of preparation. As a result of this, critical measurement features, which are subject to in-line quality control, are identified (compare Fig. 4). The preparation step starts with an investigation on which production processes of a critical product need to be inspected in-line. Two sub-steps “product analysis” and “process analysis” are used to accomplish this task. Afterward, the critical measurement features are derived from the chosen product and process characteristics. Product analysis starts with the product itself and derives critical quality features, whereas the second method, process analysis, analyzes the value stream with existing data to identify processes in need of in-line quality control. Product and process analysis can be applied in parallel, but they work independently from each other as well. The structure analysis is the first step of the product analysis. It aims at collecting and ordering information on the specifications and production processes of a product. To do so, all components of the product are analyzed in detail. Each of them allows for a specific functionality and is characterized by specifications, such as its weight or length. Additionally, all related production processes are collected. However, especially with products that have not yet reached series production, different production processes are possible. Finishing the structure analysis, all components and their functionalities, as well as the related specifications and production processes, are aligned in a morphological box (Koelmel 2016; Koelmel et al. 2014). Based on the morphological box from the structure analysis, a defects and risk analysis is performed to identify crucial manufacturing processes. The defects and risk analysis starts with deriving possible defects for all production processes collected in the morphological box. In a second step, a risk priority number (RPN) is calculated for every defect. Critical defects and corresponding production steps are identified by sorting all defects according to their RPNs. The collection of these defects results in a matrix, consisting of the processes, the defects, and the RPNs. This is called a “defects-process-matrix” (DPM). It is the final outcome of the error and risk analysis. The relevance, probability of occurrence, and the probability of detection of a defect need to be estimated by assigning a number between 1 and 10, in order to calculate the RPN of the defect. For example, assigning 1 to the probability of occurrence of a certain defect means that it never occurs. On the other hand, if the probability of detection of a defect is assigned to 10, it means that the error is impossible to detect. The risk priority number is derived by multiplying the three values of the relevance, the probability of occurrence, and the probability of detection of the defect. Thus, the RPN value varies between 1 and 1000. Calculating the RPN is a vital part of a Failure Mode and Effects Analysis (Koelmel 2016; Koelmel et al. 2014). Besides the previously presented product analysis, a process analysis can be used to deduce production processes in need for in-line quality control. The process analysis can be executed based on a method called “quality value stream mapping” (Haefner et al. 2014). This method is used to analyze an existing production system by its so-called quality value stream. It allows to identify processes that are especially relevant to the product quality. Quality value stream mapping is based on a value stream analysis, but quality-relevant characteristics are added (see Fig. 5). This includes an additional symbol for quality inspection process steps. These “Q-steps” are shown in the quality stream map and include quality-relevant information from inspections. The number of parts inspected, the scope of inspection, defects per million opportunities (DPMO), the process capability based on a Measurement System Analysis (MSA), the number of detected defects (ND), or the resulting process capability index (PCI) may be provided. The PCI may be highlighted in the quality value stream map with suitable colors. By doing so, it is immediately clear which processes are capable. Additionally, a risk priority number is calculated for each quality feature and linked to the related production process. High and very high RPNs can be highlighted by using colors. This helps to stress which production processes are especially critical. The quality value stream mapping is finished by adding information about causes of defects to the process boxes of critical processes. A quality value stream map depicts the current status of a chain of production processes from a quality point of view. It can form a base to decide which processes seem to be especially in need for in-line inspection. These processes are typically recognizable by a low process capability index or a high RPN. As soon as specific processes are identified, measurement features need to be derived. The quality value stream map can help with this step, as it shows causes for errors. These causes can then be used to derive measurement features according to the procedure from the next section (Haefner et al. 2014). The next step of the in-line process is the derivation of measurement features to be checked in-line. Critical process steps are known from the product or process analysis. They are characterized by a high RPN. As these processes are critical for the quality of the finished product, their output needs to be inspected. In case of a process analysis, the quality inspections, which helped to unveil critical process steps, need to be transferred to normal serial production. For a product analysis, however, suitable measurement features need to be derived in order to assess the performance of those critical processes. Norms, guidelines, publications, and experience help to define measurement features for these most critical process steps. Considering economic and organizational aspects, it is not recommended to measure all possible features. Only features that represent the quality of the product should be analyzed. Quality is characterized by a product fulfilling its functionalities. Therefore, the functionalities of the product need to be analyzed in order to select quality-relevant measurement features. This is a highly application-specific step and, therefore, not presented in detail in this chapter. For further advice on how to select appropriate measurement features, see Koelmel (2016). After all preparation steps have been completed, suitable measurement technology is implemented into the production line. This implementation step consists of four main parts (compare Fig. 6). First, a measurement technology needs to be chosen that is able to measure the features which have been derived in the course of the previous preparation step. Second, the accuracy of the measurement technology needs to be assessed in a laboratory. In parallel, the measurement technology is physically integrated into the production line. If either of these steps fail, another measurement technology needs to be chosen. Last, a final investigation is done in order to judge if the measurement technology is fit to measure with the specified accuracy in its production environment. There are two possibilities to choose a measurement technology that is capable of inspecting the measurement features in question. The first one is to choose the measurement technology from a so-called measurement technology catalogue, while the second option is to invent a new technology. Sometimes the development of new measurement technologies for in-line measurements is inevitable, especially for immature technologies. Every newly invented technology should be collected in a measurement technology catalogue. It accelerates the process of establishing a similar technology in future. Furthermore, it offers an overview of possibilities. How to set up a measurement technology catalogue and how to use it to choose a measurement technology is described in the following. The process of inventing a new technology is highly task-specific. Therefore, it is not described in detail in this section. In general, a physical principle or a sensing technology needs to be chosen according to the main requirements (e.g., measurement feature, measuring time, etc.). Afterward, a data analysis needs to be implemented in order to evaluate the raw signal and gain useful measurement values. Further details on a process for designing measurement equipment are provided in Koelmel (2016). Measurement features are the result of the preparation step for the in-line process (compare Fig. 4 and section “Process Analysis”). These features must allow for inspections to determine the current product quality of the production process. Relevant measurement technologies should be stored in a measurement technology catalogue to collect all technologies, which are able to detect a certain feature type. Building such a catalogue is a vital asset for implementing in-line quality control. As it is a method to store ideas and implemented solutions, it helps responding to changes in the production environment quickly. Even if the development of a measurement technology does not succeed, information on its potential use cases and advantages are not lost. Therefore, all types of developments should be listed in the catalogue including their degree of maturity. The degree of maturity helps to clarify, under which circumstances it may be worth to pick up an old idea again. Especially the advances in computer power make it possible to deploy technologies that have not found their way into series production, yet. A measurement technology catalogue is ordered by groups of defects (e.g., geometry), measurement principles (e.g., optical methods), and specific measurement technologies (e.g., laser interferometry). In terms of hierarchy, measurement technologies are assigned to measurement principles, which in turn are assigned to the groups of defects. Thus, it is possible to quickly obtain a variety of measurement technologies out of the catalogue for a certain group of defects. Additionally, only the measurement technologies are described in detail with all their features to make the catalogue easily accessible (Koelmel 2016). Additionally, characteristics of related sensor designs are assigned to the description of the measurement technologies. An extensive and clearly structured catalogue, which is of help in later projects as well, can be achieved this way. Another benefit of a well-structured measurement technology catalogue is that, even if no suitable measurement equipment can be found in the catalogue, it allows the user to gather ideas on how to develop new in-line measurement technologies using the listed physical principles. The degree of maturity is a measure for the development status of a certain type of measurement technology. It is dependent on a specific application. For example, even if a measurement technology is not used in the field of interest, it might be used in another field on a regular basis. This means that this technology has a high degree of maturity in the second field but not in the first one. It takes two steps to evaluate the degree of maturity. The first step is to characterize its technology readiness level (TRL) according to Mankins (2009). This technique is based on a checklist using criteria to distinguish between the three stages of research and development, prototype, and maturity phase. In the second step, the integration readiness level (IRL) by La Croix (2008) is calculated. Finally, the degree of maturity can be evaluated and returned to the measurement technology catalogue. Two steps have to be followed in order to choose an application-appropriate measurement technology using a measurement technology catalogue. First, by comparing the various measurement principles with measurement features that need to be detected, methods that fit best can be identified. Afterward, a compatible measurement technology has to be selected from the chosen measurement technologies. This step is necessary because it is impossible to find one measurement principle which works best for all features. Criteria for exclusion need to be checked in order to find the best-fitting measurement technology. These criteria are the size of the measured object, the resolution, the mass, and the measuring time. Then, the surrounding, the software, the staff, and the infrastructure need to be examined as well. To express the benefits of different measurement technologies, e.g., the pairwise comparison method can be used (Koelmel 2016). After a measurement technology has been chosen, its accuracy needs to be determined. The measurement uncertainty is a quantitative measure for its performance. 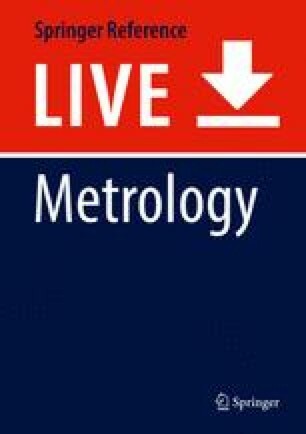 According to the “Guide to the Expression of Uncertainty in Measurement” (GUM), the measurement uncertainty is a parameter that is “associated with the result of a measurement, that characterizes the dispersion of the values that could reasonably be attributed to the measurand” (JCGM 100:2008). By determining the measurement uncertainty in a laboratory under ideal environmental conditions, it can be verified if the chosen technology is suitable for the measurement task by verifying its lowest possible measurement uncertainty. The goal of the GUM is to provide a consistent procedure to determine the measurement uncertainty by evaluating all influences on a measurement. Calculating the measurement uncertainty according to the GUM works by modelling the measurement task with a mathematical model. This model consists of all possible sources of measurement uncertainty and helps to consider random as well as systematic deviations of the measured value compared to the true value of the measurement feature. All elements of the measurement model need to be assessed and combined to form the task-specific measurement uncertainty. There are two possibilities (Type A and Type B) to estimate the influences of the model’s elements. The first is to calculate the measurement uncertainty using a statistical analysis (Type A). The second one is to use other means (Type B). This may include a priori knowledge like calibration certificates. According to GUM Supplement 1 (JCGM 101:2008), it is also possible to use Monte Carlo-based simulations in order to determine the measurement uncertainty. In the formula, U is the expanded measurement uncertainty, k is the expansion factor, ucal is the standard uncertainty related to the calibrated object, up is the standard uncertainty resulting from the measurement process, uw is the standard uncertainty resulting from the workpiece, and ub is the standard uncertainty of the bias. Together, these factors depict all uncertainties in a measuring process and allow for the expanded measurement uncertainty to be calculated. In this context, the range of the expanded measurement uncertainty covers the true value of the measurement feature with a probability of 95%. It may happen that the uncertainty assessment has to be repeated several times. If a new technology is developed or an existing technology is altered for a new application, each iteration needs to be assessed until a satisfactory outcome in terms of the measurement uncertainty has been achieved. Results obtained at this stage should be recorded in the measurement technology catalogue to provide guidance for further design iterations. According to Fig. 6, the measurement technology needs to be integrated into the production process. This means that the measurement technology needs to be adapted to its new environment on the shopfloor. This includes all design steps regarding the environment of the process on the shopfloor and those that are necessary to locate the technology on the shopfloor. This takes two basic steps: First, the technology has to be connected to its new surrounding by paying attention to means of power supply and data connection. Second, the environmental conditions need to be considered. If these conflict with the requirements of the measurement technology, suitable protection needs to be designed. For example, cameras or other sensitive measurement equipment need to be protected by a suitable housing, if they are to be used in a hazardous surrounding like a body shop where sparks are emitted. If the integration step has an effect on the measurement uncertainty of the technology, another loop of uncertainty evaluation in the laboratory, as described before in section “Referencing of Measurement Technology in Laboratory”, is necessary. This step must not be confused with the evaluation of the measurement uncertainty in the production environment described in the next section. During the integration step, the basic requirements of the measurement technology are checked. If changes to the hardware are necessary, this may have an effect on the measurement uncertainty. In such a case, the measurement uncertainty needs to be re-evaluated in order to represent the changes to the hardware. This is the case, e.g., if the measurement uncertainty of a measurement technology is known from earlier tests, while for a new project, the measurement hardware needs to be changed in order to be integrated into the production environment. Extending the previous example, if a camera is protected from flying sparks by an acrylic glass plate, its accuracy is affected. The acrylic glass plate modifies the vison of the camera, and therefore, another uncertainty evaluation in the laboratory needs to be conducted – including the acrylic glass plate. If the uncertainty assessment calls for design changes – e.g., a bigger power supply to use a camera of higher resolution – the integration step needs to be redone to provide ample power supply. Summarizing, the uncertainty evaluation in the laboratory step and the integration in the production process step are iterative steps that have to be repeated if necessary. As soon as the required accuracy is proven in the laboratory and the measurement technology is successfully integrated into the production environment, final checks need to be done. The previous steps are not sufficient to prove if a measurement technology is sufficient for in-line use. To do so, the technology’s measurement uncertainty of the measurement technology needs to be evaluated while it is used in-line. Results of these final experiments should be returned to the measurement technology catalogue in order to record that a measurement technology is sufficient for in-line use and has therefore reached a new degree of maturity. To deduce the measurement uncertainty experimentally while being used in-line, two options are possible. Both approaches are based on the experimental evaluation of the measurement uncertainty according to DIN 15530-3 (DIN EN ISO 15530-3 2012). The first option is to use another highly precise measurement equipment in-line, to execute reference measurements. This reference system does not have to fulfill all in-line relevant criteria, which apply to the chosen in-line measurement technology. For example, the referencing technology may be too expensive for in-line use, or it may not be capable of measuring quickly enough to keep up with the production cycle time. However, as DIN 15530-3 (DIN EN ISO 15530-3 2012) calls for the similarity of the measurement processes when it comes to the evaluation of the measurement uncertainty, the referencing measurement technology needs to measure under the same production conditions as the tested measurement technology. Another possibility to obtain the measurement uncertainty of the in-line measurement technology is to use a calibrated reference object on the shopfloor. It must be possible to measure this reference object in the actual surrounding on the shopfloor. This includes, for example, that a reference object needs to be fastened using the same clamps as normal workpieces, the same lighting must be used, the same working distance must be chosen, etc. By comparing the measured and the calibration values, the measurement uncertainty in the production environment can be evaluated. 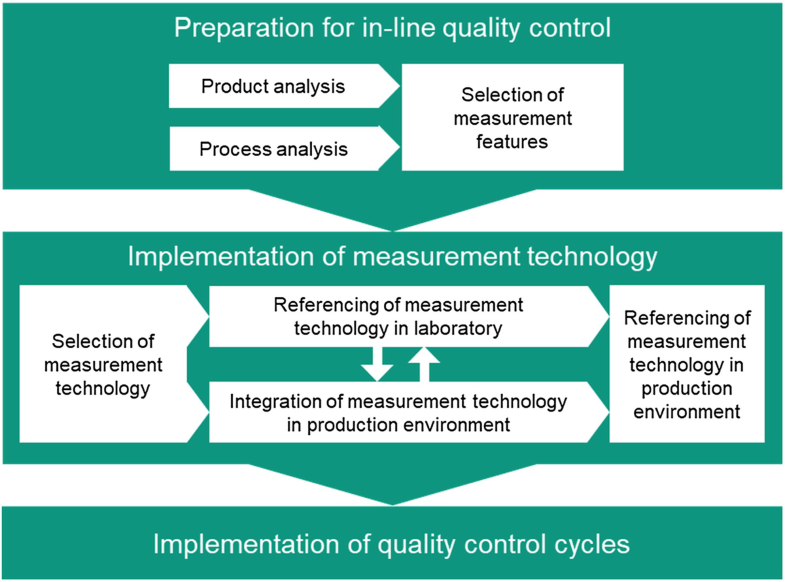 Setting up quality control cycles is the last step of the method for designing an in-line quality control system of a certain measurement feature (see Fig. 4). A quality control cycle allows to use the measurement data gathered by the in-line measurement technology in order to control production processes in a feedback loop (compare Fig. 1). The complexity of implementing quality control cycles can be very different in various tasks. A rather simple task is to decide which parts are of sufficient quality and which have to be phased out. However, more sophisticated strategies that dynamically change production parameters may also be used. The chosen strategy is highly dependent on the measurement data collected, the measurement uncertainty of the measurement technology in use, and the integration of the measurement technology in the production environment. These and the degree of knowledge about the production processes account for the data basis available and its reliability as well as the possibility of control actions. For example, if the data basis was good enough, measurement data could be used to identify what type of rework is needed, instead of simply phasing parts out. To take things even further, measurement data may be interpreted in order to use it to adjust process parameters. Information generated this way can be used, e.g., to pursue an adaptive change of machine tools because of tool wear. The chosen quality control cycles need to be consistent with a company’s quality management system. Therefore, it is specific to each use case. An example on how to design sophisticated quality control cycles is shown in section “Dynamic Production Control Strategies Based on In-line Measurement Technology for High Precision Products.” This example shows how to implement dynamic production control strategies for high precision parts. The following section presents use cases which show how to apply the previously presented steps of the method for designing in-line quality control systems. The use cases show how to set up different measurement technologies in order to measure in-line. Each aims at placing emphasis on a different step of the process presented before. Not all use cases use every method that was described in the sections before. Nevertheless, they show how the steps of the method can be applied in practice. As such, the use cases help to underline that different boundary conditions call for different strategies to set up in-line measurement technologies. Carbon fiber reinforced plastics (CFRP) have gained a lot of importance in industrial manufacturing of structure components. This is due to the fact that the application of CFRP allows a mass reduction of 20–50% compared to conventional materials such as aluminum, steel, and plastic components. Especially automotive and aeronautical applications benefit from the reduction of moved masses because the emission of harmful exhaust gases is bound to them. In order to exploit the ecological and technological benefits of lightweight designs, their dissemination in products is to be increased globally, which is only possible by high degrees of automation in processing and sufficient quality control. Therefore, production processes are to be analyzed, and quality features along the value chain must be identified in order to derive a suitable in-line measurement technology. In order to prepare the in-process quality control of CFRP components, the product as well as production processes are analyzed, and the relevant measurement features are selected according to the method described in the chapter “Designing an In-line Quality Control System”. Resin transfer molding (RTM) is a production process for CFRP components that offers the possibility of highly automated handling and process steps and therefore meets the major requirements of a large volume production. The process consists of five major steps that can be seen in Fig. 7. In the first step, continuous filament mats are cut and stacked according to the layer structure that is defined in the design process. The orientation of the fibers is very important with regard to the laminate structures because more forces can be transmitted along the fibers in comparison to relatively deviating force directions. Therefore, the subsequent preforming, where the stacked fiber mats are forged to complex 3D forms in near net shape, is a quality-critical process. During forming, fiber mats can misalign due to the process strategy, or pleats in the material may occur due the applied forces. Also, each material type has individual mechanical properties, leading to different effects during preforming. Different types of preforming can be applied, in order to reduce negative effects. If textile defects are not noticed after preforming, additional value is added to the part even though its quality is already diminished. After the part is preformed, the semifinished part is inserted in infiltration cavities, and a resin/hardener mixture is injected under high pressure. It is then cured under controlled temperature. During these steps, the preform quality does not change significantly, and occurring defects such as delamination are bound to the matrix. In conclusion, it can be stated that it is not sufficient to detect textile defects in final parts in order to efficiently control the quality during the RTM process chain. Instead, the quality characterization of preforms can be used to avoid unnecessary value-added steps by means of in-line measurements. Orth defines basic measurement tasks for the quality control of CFRP components in order to guarantee a high part quality. For the identification of the texture type, the main task is to avoid systematic errors such as wrongly used raw material. Besides the identification of the material type, there are also different bond structures that can be swapped unintentionally and lead to accordingly different mechanical properties. Furthermore, local anomalies such as defects in the texture, like fiber or tow gaps, need to be detected as well. Therefore, the main measurement features in carbon fiber preforms are the tow orientations throughout the layer structure. Besides the described measurement features, there are further restrictions that need to be taken in consideration for the implementation of measurement technology in CFRP process chains. In order to increase the efficiency of the production, a high testing frequency is needed, as the processes do not fulfill the high requirements of the automotive industry with regard to the process capability and stability. Thus, sample-based inspections are not sufficient. Instead, short measurement times need to be realized. In this case, to effectively detect fiber delamination during the preforming process, in-line measurement is necessary. Thus, potential measurement methods for this are analyzed. Radiographic methods like industrial computed tomography are restricted in their applicability as in-line testing method due to long measurement times and the necessity of part handling. Optical methods only have a limited applicability for inspection purposes in CFRP production because the entire layer structure must be characterized in order to guarantee the quality of the part, as the entire structure is responsible for the load-bearing capacity. Also, auxiliary materials that are necessary for testing purposes must be avoided to not influence the tested part negatively. This is why coupling media that are mostly used for ultrasonic testing are not an option for the inspection of dry semifinished textiles. The applicability of thermographic methods is bound to additional measurement stations in the production line, limiting their applicability as process-integrated testing methods. Electromagnetic methods offer the possibility to quickly determine fiber tow orientations due to their anisotropic electric conductivity. For this purpose, electric coil arrays can be integrated inside preforming tools for the assessment of the main quality characteristics. The elementary sensor consists of various emitting coils and one receiving coil that are used to measure the fiber tow orientations by analyzing anisotropically induced voltages. Due to the low process forces of the preforming process, there is the possibility for integration of the sensor in preforming tools, which is bound to their static application. However, a static application demands the identification of quality-critical part zones. In cases where components are part of assemblies, dimensional tolerances must be respected within the joined parts. Furthermore, the application and insertion of additional load applying insert components in carbon fiber reinforced components requires the quality control of mechanical interfaces. After designing the components, numerical FEM simulations offer the possibility to show the load path when applying forces on the hybrid structure. Figure 8 shows the principle of sensor integration in preforming tools and the data that can be gained during the measurement. The uncertainty that is bound to the resolution of the measurement system is represented by uRE and can be derived from the datasheet of the applied measurement system. uCAL represents the uncertainty resulting from the calibration process. For the reference of the eddy current sensor, an industrial computed tomography system was applied. The data that was gained was analyzed by using a fiber analysis toolbox by Volume Graphics. It allows the evaluation of single fiber orientations throughout the entire specimen. uEVR represents the deviations resulting from repeatedly conducted measurement task. uBI are systematic deviations compared to the reference value of the reference normal. The uncertainty resulting from a lacking linearity is represented by uLIN and is gained by at least three reference parts, whereas the nominal value is varied systematically. The deviation from the linear expected correlation is transferred to the respective standard deviation value. With an expansion factor of k = 2, a coverage probability of 95% is given for the expanded measurement uncertainty. During preforming, different types of defects can occur that are bound to various process properties. Therefore, their detection and classification in defect groups such as misorientations, tow gaps, or wrinkles allows the optimization of single process parameters and the implementation of suitable quality control cycles. Systematic fiber orientations may be caused by defective pick-and-place processes through robots in the process chain, whereas wrinkles may be caused by faulty forming parameters. Once the occurrence of defects can be traced to their cause, methods of automated signal characterization can improve single process steps within the production process. Especially methods of machine learning such as artificial neural networks enable the automated interpretation of signal characteristics by identifying patterns of scrap parts. Sheet molding compound (SMC) is a discontinuously reinforced glass fiber composite material and has been known for 60 years (Nicolais 2011). It is used in various areas, such as building construction, civil engineering, and the automotive industry. In the latter it is used for tailgate lids and other coverings. Regarding the preparation for in-line quality control, the production process chain of SMC consists of several steps (compare Fig. 9). In the first step, a paste of all necessary raw materials such as resin, hardener, and additives are mixed and used up by squeegee boxes on two films. Afterward, discontinuously cut glass fibers are inserted between these two foils, which are then merged together. Air pockets are forced out through a calendering zone and the fibers are completely impregnated. Then the material is rolled up and is available as a semifinished product, which in the following is matured in a cabinet until it has reached the right consistency. After the maturing process, the necessary material is stacked and pressed into the desired shape. By using SMC, considerable weight savings can be achieved. Today, however, hardly any structural components are produced thusly because the mechanical properties of these fiber-reinforced plastics are not sufficient. In order to increase the mechanical properties, the discontinuous SMC is locally reinforced with continuous carbon fiber tapes. This way, the mechanical properties can be improved locally, but also the advantages of fast cycle times and low reworking are retained. In the SMC, many error patterns can occur leading to a bad result. These include, for example, resin accumulations, poor fiber impregnation, or delamination – the most common errors in this product that need to be detected during the production and the resulting bad parts must be phased out. To do so, in-line quality control is needed in order to check all parts. The motivation for measuring in-line, therefore, is a need for quality. Due to the combination of two materials, which differ in their properties, further error patterns can occur. These include, for example, gapping and wrong fiber orientation in the continuous material. This is only a small selection of errors, which can occur very often and have a great effect on the mechanical properties. In order to avoid unnecessary, value-adding measures, the quality of the material must be checked at an early stage of component manufacturing, so that the defects can be detected and modified at the stage of the semifinished product. This way in-line checks prohibit excessive costs. The motivation for in-line quality control is therefore not only quality needs but also long-term savings. In order to ensure a smooth operation without delays, the inspection must take place within approx. 90 s. This is the average cycle time of the press. In order to ensure complete verification, quality control must be carried out in-line. In this example, the most common errors are first analyzed. The semifinished product is considered faultless, when it contains, i.e., no air bubbles or incomplete impregnated fibers. As a measurement technology catalogue is not at hand for the given tasks, a new sensor needs to be developed. To choose the appropriate attributes of the sensor, the steps described in section “Designing an In-line Quality Control System” are used. The most common defects to be investigated are delamination, contour and shape deviations, foreign bodies, fiber orientation, and folds in the material. These five defects can be subdivided into external and internal defects. Based on this analysis, suitable in-line measurement technology is implemented. There is a variety of measurement methods for these two defect classes. For internal defects, computed tomography, ultrasound, or thermography is recommended. For external defects, the laser light section method, strip projection, computed tomography, or image processing methods are possible. Other ancillary conditions, such as cycle time or noncontact methods, limit the possible measurement and testing methods; therefore the laser light section method is selected for external defects and thermography for internal defects. According to section “Referencing of Measurement Technology in Laboratory,” potentials of the chosen methods need to be assessed, in order to prove that it is compatible with the measurement tasks. Therefore, the measurement uncertainty needs to be determined. To do so, both methods are tested individually on test objects made of SMC semifinished products and hardened material. The optimal parameters of the individual methods in the laboratory environment are determined in a first step. The following figure shows a component and the so-called cloud of points (CoP). The component consists of discontinuous glass fiber SMC with continuous carbon fiber tapes. To determine the measurement uncertainty, reference measurements with the CT and tactile measurements are carried out to calibrate the component. Subsequently, 25 measurements are performed with laser triangulation (Fig. 10). Figure 11 shows a pulse phase thermography image of a cured component with glass fiber SMC and carbon fiber tapes at different frequencies. The tapes and their orientation are clearly visible, as well as dry spots of the tape or delamination. This method is therefore very suitable for internal defects and fiber orientation. The aim of the further work is to combine both methods in a multisensor system and to generate further information by information fusion (Weckenmann et al. 2009). The physical structure is illustrated in Fig. 12. For the implementation of effective quality control cycles, by combining these systems, it is possible to establish correlations between the deviations. These are additionally coupled with the mechanical properties so that a prediction can be made as to the mechanical properties of a component. Due to the in-line measurement, it is possible to do this in a cycle and to examine semifinished products in order to make predictions about the later component quality. Laser beam melting (LBM) is a metal powder-based process, where the powder gets layer-wise molten to create a 3D-printed workpiece. It is already well-established for prototyping and becomes more and more important for the series production in various industries like dental, aircraft, and automotive. 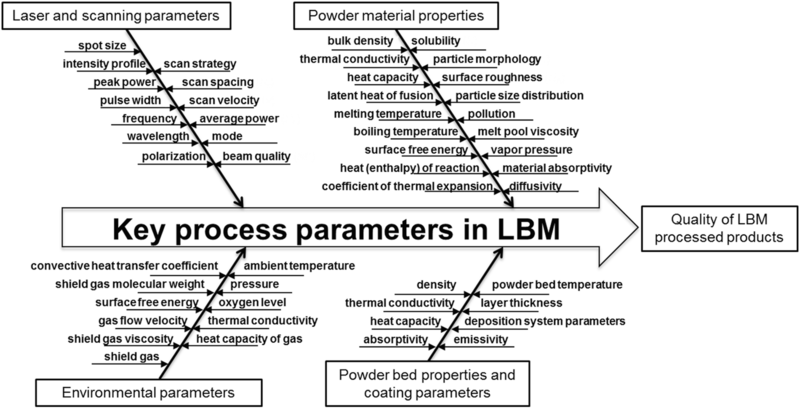 Overall LBM is one of the most promising additive manufacturing methods for further industrial application and part of current research (Lanza et al. 2017; Eschner et al. 2017a). The advantage of additive manufacturing and the reason why it is considered for series productions is the high degree of freedom for the product design. For instance, by adding a grid structure to the inner part of the gear, it is possible to apply damping effects and additional cooling effects and apply lightweight design as illustrated in Fig. 13 (Fanselow et al. 2016). LBM-processed parts often have complex structures which are sometimes inside of the product and thereby hidden from visual inspection. This also limits the measurement methods, which will be discussed later. To spread LBM in challenging series productions like aircraft or automotive, legal and safety regulations have to be met. This is especially crucial for LBM since it has high potential for lightweight design and thereby is of special interest for aircrafts. Furthermore, to realize a long-term cost-efficient process, it is necessary to have a stable and monitored process. This is necessary due to the high rate of reject and the expensive end-of-line measurements, which are mostly realized coordinate measuring technology or computed tomography. Currently there are several activities to realize suitable in-process measurements (Everton et al. 2016). Analyzing LBM in terms of the preparation for in-line quality control, one of the first things to note is its overall complexity. More than 50 parameters influence the product quality as shown in Fig. 14. These parameters can be grouped in four categories, referring to the laser, powder material, build environment, and coating process. Due to the high amount of complex interrelations between these parameters, it is very challenging to generate a high and stable quality of LBM during series production. Thus, a suitable in-process measurement technology is required to control the quality of the manufactured product. The deviation of LBM results in various defects within the manufactured product. According to Aleshin et al. (2016), the most important defects are cracks/material discontinuity, porosity, increased degree of stress, and increased roughness. The most severe are typically cracks/material discontinuity and porosity, since these affect the fatigue performance (Fig. 15). The analyses of product and process clearly show that a measurement technology evaluating the inner structure of the product is needed. Current in-process measurement technologies are limited to the evaluation of the melt pool or surface. Due to the layer-based process, these surface-oriented methods could also give an insight to the inner structure. Nevertheless, there are defects inside the product which cannot be detected with these methods. Further requirements result from the size of the discussed defects. The size of the pores usually varies between 5 and 500 μm (Everton et al. 2016). As a result, the executed product and process analysis shows the need of a three-dimensional in-process monitoring of the inner structure of the built product. For a suitable implementation of measurement technology, potential measuring and nondestructive testing methods are analyzed. These are summarized in Fig. 16. The ones below the red line are only capable of detecting surface and near-surface defects. As mentioned above, in order to detect the most crucial defects for LBM, a method covering the entire volume is needed. For this acoustic waves and CT are suitable. 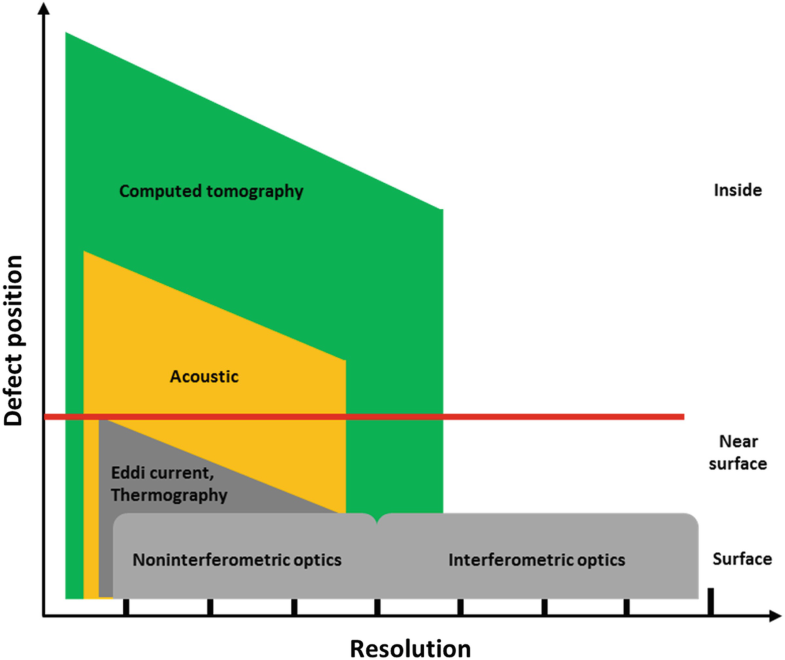 Comparing the complexity and needed investment of acoustic and x-ray sensors, acoustic is much less complex and expensive. On the contrary the resolution of acoustic waves is limited to defect pores in the scale of approximately 50–100 μm. For many industrial product defects, however, this is still sufficient for pore analysis in LBM. Thus, for evaluating interior defects, an acoustic sensor was selected. Next, several acoustic sensor technologies and integration options were analyzed. For generating and receiving acoustic waves, generally three types of actor/sensor configurations can be distinguished: piezo, laser, and electromagnetic acoustic transducer (EMAT). To integrate the sensors, two types of volumes can be identified: below the build platform and above the powder bed. By systematically comparing the different possible solutions and rating them against each other according to a structured selection process, the most promising solution was identified, using structure-born noise (Eschner et al. 2017b). 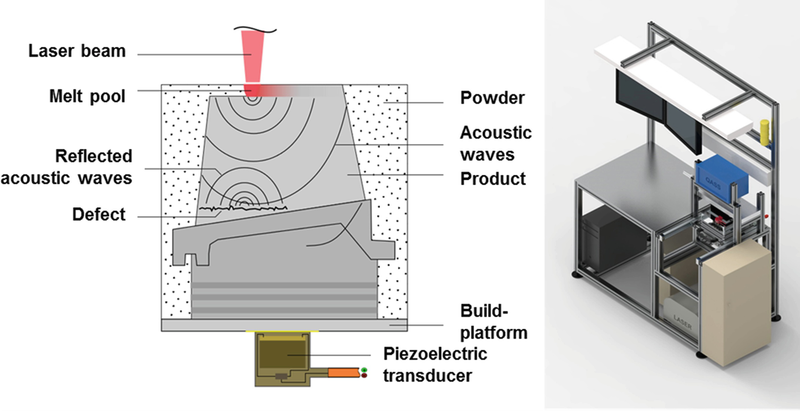 In this approach, the noise generated by the process itself can be analyzed, and process characteristics can be evaluated. This approach is already known from laser welding, where a feature extraction with a fast Fourier transform (FFT) analysis is used to identify irregularities in the welding process as shown in Fig. 17 (QASS 2018). 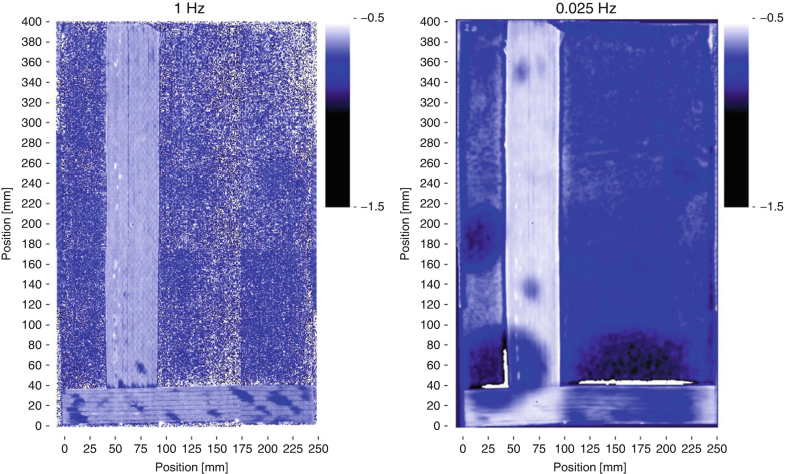 A schematic representation of the integration of an acoustic structure-born noise sensor configuration and the realization in an experimental setup are shown in Fig. 18. Using the signals from LBM and an adequate feature extraction approach, a machine learning algorithm can be applied, and product properties can be measured. These product properties, like the number and size of pores, characterize the product quality. To train such an algorithm for the data analysis and characterize the performance of the measurement system reference, measurements are needed to evaluate the measurement uncertainty. To create the amount of data needed to train a machine learning algorithm, computed tomography measurements are used. With this, it is possible to characterize pores in size and overall volume. For the evaluation of specific measurement uncertainty of the pore measurement through computed tomography, reference measurements with micrographs are executed. To create test specimen with certain pore characteristics, LBM parameters like laser intensity are varied in a systematic way according to a design of experiments (DoE). Using the described in-process measurement technology, it is possible to identify products which have flaws that will significantly affect the quality of the product. With this information, products which are most likely to brake during usage can be separated and be excluded from further value adding and a respective quality control cycle can be implemented. Furthermore, with the help of the above described measurement technology, it will be possible to actively influence the product properties. For some applications it could be useful to create pores of a certain size on purpose to optimize its function. This could be the case when it comes to lightweight or damping structures. The feedback of the measurement technology allows to tune laser parameters to get the wanted pores. Manufacturing companies in various industries have to meet rising quality requirements on behalf of their consumers. Companies need to balance between keeping production costs at a low level and fulfilling customers’ demands. Meanwhile, precision requirements increase and reach technological production limits. High requirements occur especially within the automotive industry, for example, high-pressure fuel injectors, hydraulic transmission actors, electric motors, and precision bearings. Herein, precision requirements tend toward narrow ranges, with tolerance ranges of only a few microns, in order to realize highly accurate functions with an optimal degree of efficiency (Lanza et al. 2015; Peter and Fleischer 2014; Colledani and Tolio 2006). Often the economic realization of precision products is a conflict of objectives in the manufacturing and assembly process. Saving production cost with high throughput under higher deviations contradicts preventing a high number of scraped units with more narrow tolerances under higher capabilities. Often even technological limits of the manufacturing processes are reached, when producing cutting-edge products. In order to decrease production costs in such challenging cases, producers have to focus on the value generation and develop intelligent and dynamic control strategies in the production system so that costs for different types of waste like scrap, rework, and storage are minimized (Iyama et al. 2013). In-line measurements of the crucial quality features along the entire process chain in the production system in real time are the basis for this. The gained data can be used to implement dynamic production control strategies which individually adapt the production parameters of manufacturing and assembly processes for every single product. As an example a high-pressure fuel injector consists of several precision subsystems with in total approximately 30–40 components, related to different disciplines, such as mechanics, mechatronics, and fluid mechanics. 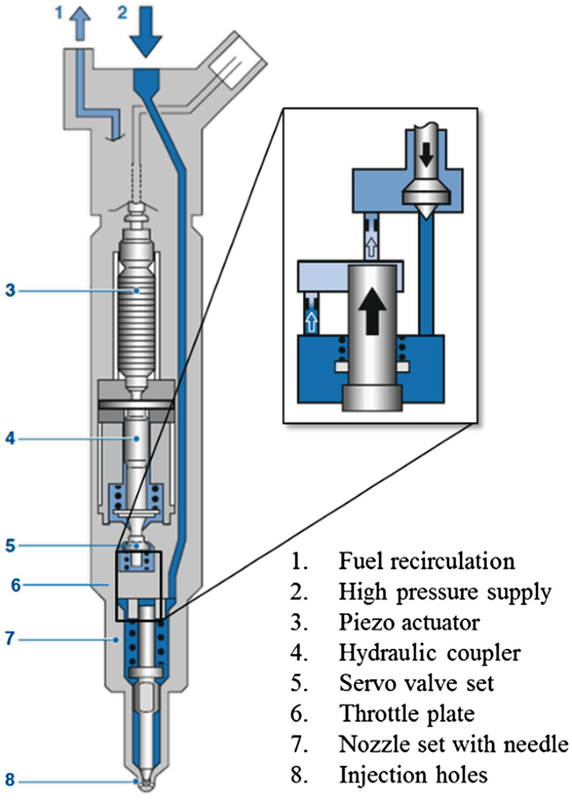 The principle of the indirectly controlled piezo fuel injector is introduced in Reif (2012) (see Figs. 19 and 20). All main subsystems, piezo actuator, servo valve, throttle plate, and nozzle set, directly affect the product function, which is a defined fuel injection volume with a tolerance of less than a milliliter, at a fuel pressure of more than 220 MPa, within few milliseconds. The product has to meet both challenges, high precision in volume portioning and high dynamic control, with up to five injections per cycle. The manufacturing of each subsystem is very complex and approaches the technological limits. To assure the product functionality, very narrow tolerances are assigned to the relevant interdisciplinary characteristics. Regarding the product and process analysis for the preparation for in-line quality control in the production system of injectors, there are many crucial quality features. Most of them are related to the thickness or horizontal distances of certain components, or the diameter of shafts and holes. Due to the very narrow tolerances of less than 10 nm of all these quality features, the implementation of measurement technology in-line or even in-process at the respective stages of the production system is already a common practice with industrial manufacturers. For these, 100% of product components are measured, through suitable measurement technology, and tracked by a manufacturing execution system. The thickness and the distance of components is typically measured by ID tactile probes. The diameter of rotational features in most cases is measured with a pneumatic sensor. Both sensors enable first measurements with a task-specific measurement uncertainty in the range of 1 μm. Moreover, to guarantee that these measurement results can be related unambiguously to individual components in the production system, each component is to be tracked by means of suitable traceability technology. Depending on the product and process characteristics, typically, e.g., RFID technology related to the workpiece carrier or DMC/QR code markers of the components are used. Recent approaches enable track and trace based on an optical measurement of the surface structure (Kock 2017). These extensive in-line measurement capabilities provide the possibility for the implementation of very advanced quality control cycles in the production system. 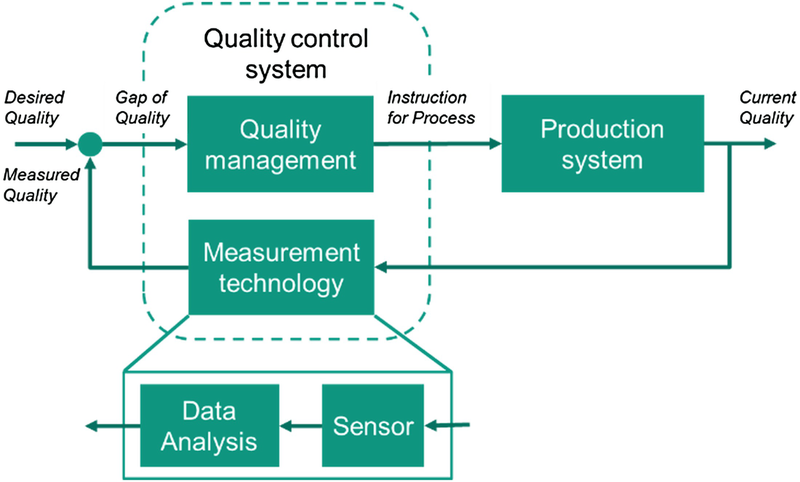 These quality control cycles enable new possibilities for intelligent, robust, and cost-efficient production strategies beyond the manufacturing limits (Wagner et al. 2018) (see Fig. 20). In the context of “Industrie 4.0,” these are realized by creating a suitable cyber-physical production system (CPPS). The main idea of these quality control cycles is based on the individual overfulfillment of one component characteristic, which gives the opportunity to compensate the corresponding quality-critical characteristic of a second component. By harmonizing associated components, more narrow tolerance margins can be realized in comparison to conventionally assembled components (Mease et al. 2004). This concept is often also called “pairing” or “matching.” Different quality control cycles are possible to ensure product quality, including assembly, production, or even product development and tolerance allocation. The integration of several stages in the product development process and production offers greater possibilities to ensure product quality but requires increasing effort preventing scraped products. In Lanza et al. (2015), a framework of six general categories of production strategies based on quality control cycles was developed (see Fig. 21). Selective assembly, as one category of these production strategies, describes a method to increase the quality of products while decreasing the production costs by minimizing errors that occur during the production (Loosen and Funck 2011). Single components are grouped into multiple tolerance classes based on their individual deviation from a certain set point and subsequently paired with an appropriate corresponding component (Colledani et al. 2014). Generally, in the process of grouping components into classes, information about the exact geometries gets lost. Both the amount of classes and the tolerance margin define the degree of information loss (Colledani et al. 2014). A high number of classes and narrow tolerance margins are preferred for preserving precise measurement data. However, on the other hand, it is essential to hold enough components for each class. Therefore, the number of components, the resulting inventory, and overhead costs restrict the number of tolerance classes. In case of lacking components, active and passive combinations of non-corresponding classes are applied to avoid downtimes (Ebrahimi 2014). Individual assembly is a production strategy to reduce the loss of information compared to selective assembly, since components are not grouped into tolerance classes and the exact measurement values saved in combination with the distinct storage place. However, high organizational and technical requirements are needed to implement individual assembly (Loosen and Funck 2011). Using the approach of adaptive manufacturing, as another category of the production strategies, surplus components for single tolerance classes are prevented through consumption-oriented production of corresponding matching components. Therefore, the statistical population of the quality-critical component is recorded, and the corresponding component is produced under adaption of the nominal value. The statistical population of adaptively manufactured parts needs to fit to this population. This ensures that in total every component can be matched and the required overall tolerance level is met (Matsuura and Shinozaki 2011). Combinations of selective/individual assembly and adaptive manufacturing seem to be promising to achieve high rates of good parts as well as low production costs and production times (Kayasa and Herrmann 2012). 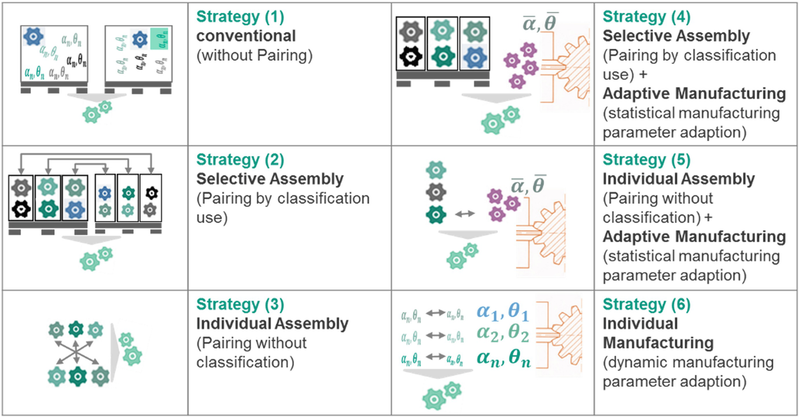 Different subcategories of compositions of selective/individual assembly and adaptive manufacturing offer various new production strategies (Lanza et al. 2015). The strategy of individual manufacturing links the ideas of individual assembly to a minimum storing capacity of provided assembly components. One of the components is supplied as half-finished product and individually finished after measuring the quality-critical component. Obviously, a manufacturing process with lower process deviations than the overall tolerance is required for the implementation. Savings of lower supplied storage capacities are accompanied with a larger investment for an appropriate machine. In order to assess the effects of the chosen configuration of the quality control cycles on the economic and quality performance of the production system, the introduced production strategies use different configurations of the production system as a digital twin implemented within a cyber-physical production system controller. An event-driven simulation model is modelled. An exemplary production system model is illustrated in 24, consisting of two process chains of manufactured components (processes P2 and P3). The final components are joined in an assembly station (A) to the final product. Without loss of generality, the process chains of the mainly relevant quality features can each be considered as single manufacturing processes. 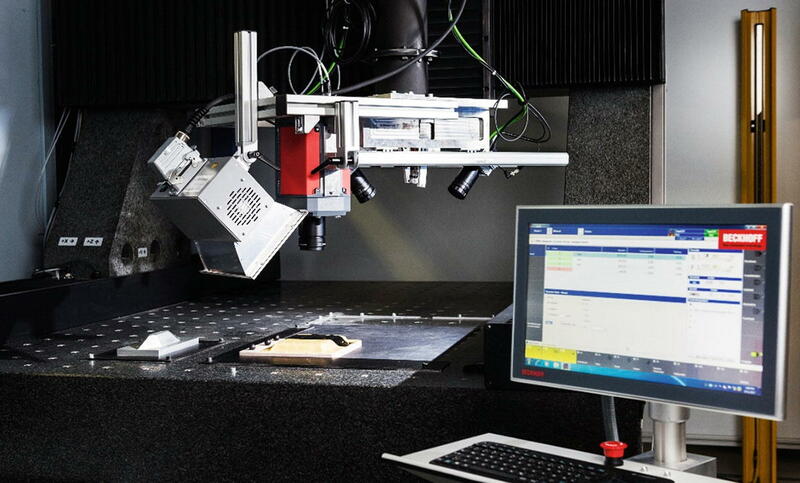 Economic 100% in-line inspection, e.g., using pneumatic sensors or functional fluidic end-of-line measurements, enables the assessment of the individual quality of each component and the final product at the end of the line (Q1, Q2, Qfinal). After the in-line inspections Q1 and Q2, the inventories I1 and I2 are located, in which components can be stored randomly, in classes, or individually traceable. Optimization methods are applied in order to determine the fittest strategy configuration of the quality control cycles for a specific use case in industrial practice (Lanza et al. 2015) (Fig. 22). As a result, the most suitable quality control strategy is selected based on the total cost. Total cost assessments include production cost (equipment cost, labor cost, material cost, additional implementation cost for cyber-physical production system), quality cost (scrap cost, cost of measurement errors due to measurement uncertainty), and inventory cost (referring to the cost of the components, storage costs, and opportunity cost in the inventories). Thus, the optimal strategy can be identified for each individual component in real time to economically produce high precision products (Wagner et al. 2018).